Material: boron silicon heat resistant glass. Package Included: two empty glass planters and free no-mark wall hooks. Size M: Opening diameter 2-1/2" x 6-1/2" Height. Size L: Opening diameter 3-1/2" x 9-1/2" Height. 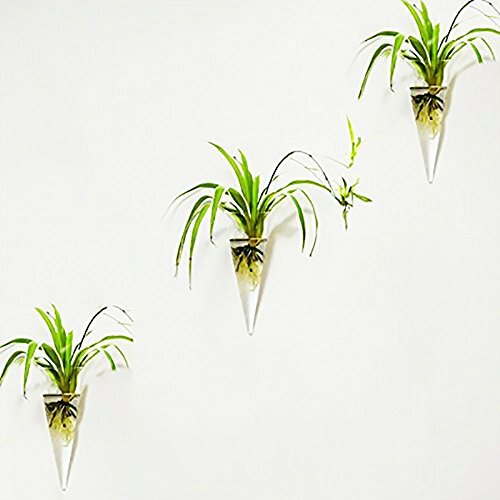 This fashion and elegant planter is very beautiful and attractive. Rural style, give you a different life of emotional appeal. Create a fashion life atmosphere, Make your life more poetic and relaxing. Also modern design to any place. This cute little glass terrarium is the perfect vase for your imagination, made of high boron silicon heat resistant glass. Strong and durable, water-saving drought-resistant, pervious to light, not easy deformation, corrosion resistance. With a small hole design, which allows you to install on the wall. Fits for an air plant, flowers, sand, colored pebbles. Great for sending to your dear friends or family as gifts. I believe that such a beautiful hanging vase will let your friends and family love. It helps beautify and purify your house or office, a good decoration for you. Rural style, fashion and elegant. Crystal clear hand-blown glass, Create a fashion life atmosphere, Make your life more poetic and relaxing. Material: Made of high boron silicon heat resistant glass. Strong and durable, water-saving drought- resistant, pervious to light, not easy deformation, corrosion resistance. Fill with small plants, cobble, or other decorative objects and use as an eye-catching decorative accent or centerpiece for any space. Ideal for home, garden, Wedding or holidays as a deco. Perfect for sending to your dear friends or family as gifts. Special cone model, With a small hole design, which allows you to install on the wall. can add plants, white rocks, pebbles, acrylic, and other decorative items with ease. Size M: Opening diameter 2-1/2" x 6-1/2" Height.Package Included: two empty glass planters and free no-mark wall hooks. Please note that No plant included in this item! Mkono is a registered trademark and our product is professional manufacturing and sole selling.